This is the third Elizabeth Chadwick book I’ve read, and I just love her work. The other two I’ve read relate to this one and are well worth reading if you enjoy historical fiction. The first, Lady of the English, is the story of Henry II’s mother, the Empress Matilda, who fought all her life for the English crown. The second is the first book in this series about Eleanor of Aquitaine: The Summer Queen. 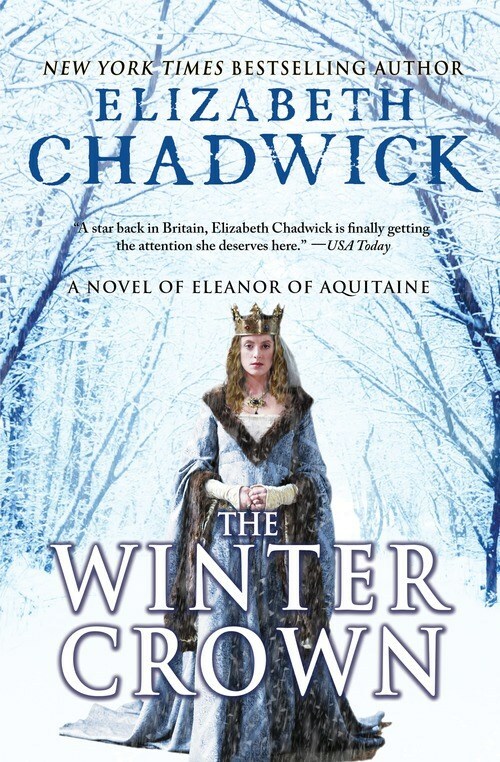 This book, The Winter Crown, is book two in the “Eleanor of Aquitaine” series. THE PLOT: This book picks up right after the end of The Summer Queen. After her horrible marriage to Louis VII of France, Eleanor (called Alienor in these books) dares to think she might be happy. She and her new husband, Henry, have been declared King and Queen of England, and their family is quickly expanding. Alienor is enjoying the power and passion she shares with Henry, but she’s concerned that he might just see her as a brood mare, the vessel by which he’ll gain plenty of heirs. After all, if he keeps her pregnant and recovering, she’ll be less able to rule her own duchy and he’ll have even more power. By the time Alienor gives birth to her last child, John, Henry is moving on from various mistresses to just one: the teenage Rosamund de Clifford. Henry is proud of their many children, but as they grow toward adulthood, he’s reluctant to allow them any real power. He has their son Harry crowned king alongside him, but won’t give him any responsibilities. Second son Richard is the heir to Aquitaine, but with some underhanded maneuvering, Henry makes it appear that Aquitaine is a vassal of England. The daughters are sent away to other countries as alliance brides way too soon for Alienor. What once was a promising, passionate marriage falls apart, and an angry Alienor gives up calming her sons’ anger against their father. When all-out rebellion breaks out, Henry blames Alienor. MY TWO CENTS: What I enjoy most about Chadwick’s work is how natural it feels, how you sink into this world of almost 1,000 years ago and feel as though you’re really in it. It never strikes a false note for me. I never feel as though I’m reading something modern masquerading as historical. Chadwick does a great job filling in day-to-day details of life in the 1100s and making them seem authentic. Alienor is written as a very human character. She doesn’t adore her mother-in-law, Matilda, but she’s perfectly willing to use her as an ally. She loves her children, but mourns the lack of relationship of the abandoned daughters she had with Louis. She admits that Richard is her favorite, but she also scolds his hot-headedness and lack of self-discipline. She doesn’t love Henry, but she wants a pleasant marriage with him…right up until she’s had enough. We also see Henry’s transition from ambitious young man to overbearing tyrant. He always wanted everything his own way, but as time goes on, he just gets more and more ruthless. If you know anything about Henry and Eleanor, you know how their relationship ends. It’s to Chadwick’s credit that the reader keeps hoping that history will somehow change and Eleanor will get a happy ending. BOTTOM LINE: If you already enjoy Chadwick’s work, you’ll love The Winter Crown. If you’ve never tried Chadwick before but love historical fiction, I recommend starting with The Summer Queen and then going on to this. Then, while you wait for the release of Book 3, The Autumn Crown, read Lady of the English. I’m heading on to her William Marshal novels. TEACUP RATING: Five out of five teacups. Chadwick has become an auto-buy for me and this doesn’t disappoint. ON SALE DATE: Available in the US on September 1, 2015, in paperback and eformats. Already available in the UK. « The Doctors Are In by Graeme Burk and Robert Smith?